Pohnpei Cinemas has been packed since Disney’s Moana opened on November 22 selling out more shows than the most recent Star Wars movie. I would know, as I’ve been to watch Moana twice, once on the Sunday morning of opening week and again this past Friday night. The film will have already made well over $100 million by the time this goes to print. It is no surprise that Moana is another “Disney Princess” blockbuster. 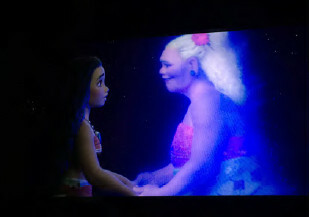 Pacific Islander academics were quick to criticize the film for the ways it continues to colonize our minds with manufactured feel good storylines and characters that are often culturally appropriated, and seek only to make Disney more money at the expense of our misrepresented indigenous Pacific cultures and peoples (scholars Teresia Teaiwa, Tēvita ʻŌ. Kaʻili and others have critiqued the film). They are right! Disney is a corporation that spends billions (yes, billions) of dollars on advertising alone; their main aim is to entertain and make a profit, not to be culturally sensitive. We in the Pacific are just as susceptible to Disney’s seduction as everyone else, and in the case of Moana, even more so because it is supposed to represent us. Here in Micronesia we are also allured by the “magic of Polynesia”—Polynesian dances are more popular than our own, things Hawaiian and Tahitian are often seen as more beautiful and better than our own. Why is this? we might ask. I believe Hollywood (which includes Disney) plays a role, and our understanding of Polynesia is in many ways superficial and “feel good.” For many of us, Polynesia is Moana, and we view the movie without being aware of its inaccuracies because we don’t share the same stories as Polynesians. For example, from what I know, there is no Maui in Micronesia, although similar deities exist. One of the things that struck my friend Karnim and I at the end of Moana was when Te Fiti reclined and became an island. Of course, we immediately thought—Kosrae! Returning to the Micronesian gaze, when I asked my 9-year-old niece what she liked about Moana; she replied “e lel pwe kasdohn Hawaii” (it’s good because it’s a Hawaiian movie). There you go. Let’s face it, most Pacific Islanders won’t read any of the reviews of Moana including this one. Most of us will just watch the film and leave feeling good and proud to be Pacific Islanders, “validated” by Disney. Given this, what can we take away from Moana as Pacific Islanders? For one, it is kind of feminist. Moana is an inspiring young woman: a daughter of a chief who sails out beyond the reef to save her island. She is headstrong, feisty, courageous and curious (note: these are characteristics often frowned upon in girls in most Pacific societies). Moana is a girl who knows what she wants, but she is also disobedient. She doesn’t listen to her father who does not want her sailing off alone on a canoe (forget that ridiculous scrawny chicken). Pacific Island daughters everywhere can identify, but Moana is not your average obedient Pacific daughter. After all, the ocean is her friend. If we look at Moana in terms of the twenty-first century, she is the girl that finishes school and flies off in an airplane to receive a higher education. She studies hard, graduates with honors, and returns to her island with high hopes of saving her people from corruption, global warming and heart disease. In order to be so accomplished, however, Moana needed strong female support in the form of her powerful grandmother. Her relationship with Gramma Tala is one of the most moving parts of the film, and it is this relationship that gives her strength and allows her to fulfill her destiny. Will young girls who watch Moana want to be like her? Most definitely! At least when they watch this film they will see a brown girl who looks a lot more like them than the other Disney princesses whose main objective in life is finding a prince. Unlike Cinderella, Ariel and Aurora, Moana is chasing her dreams. If young Micronesian girls can take away one thing from this movie let it be that they can do anything, all they need is their grandmas and the stars to guide them. One last thing, we must acknowledge Mau Piailug of Satawal, Yap, who shared his wayfinding knowledge with the Hawaiians. Disney should cut a check for his family because without him Disney’s Maui would be lost at sea. Kalahngan lap!